The Grand Canyon on Earth might feel a little inadequate if it ever learns about Argo Chasma on Pluto's moon Charon. 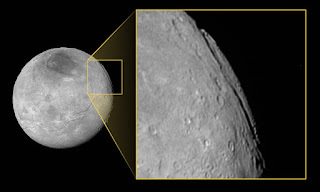 Charon is home to a canyon 185 miles (300 kilometers) long and up to 5.5 miles (9 kilometers) deep in places. NASA says Argo Chasma also has one of the tallest known cliff faces in the entire solar system. Scientists are working with images and data from the New Horizons spacecraft, which launched in 2006 and reached dwarf planet Pluto in 2015. Compared to the Grand Canyon in the US, Argo Chasma is five times deeper and 150 miles (240 kilometers) longer. Imagine the sheer terror of looking down if someone ever builds an Argo Chasma Skywalk with a glass floor.